Almost 13 years later, I dug up all nine seasons and watched them in three months. That’s 201 episodes. Don’t ask me how, it’s not important to know which adult duties were neglected. I live tweeted it here. For the few people who don’t know this, The Office US is based on The Office UK, a mockumentary styled comedy on the lives of the “regular” office workers in Dunder Mifflin, a paper company in Scranton, America. Michael is the WORST (but not always, sometimes he is the best, but also sometimes the worst and also sometimes simultaneously the best and the worst). Replacing Michael was tricky, I was a bit worried the show would come crumbling down, the way it did when JD was no longer the narrator on Scrubs, but somehow, they made it work. I am not sure whether or not I missed Michael, but seeing him right at the end had me feeling many feelings. Oh, I am glad they quickly realised Will Ferrell had no place here. 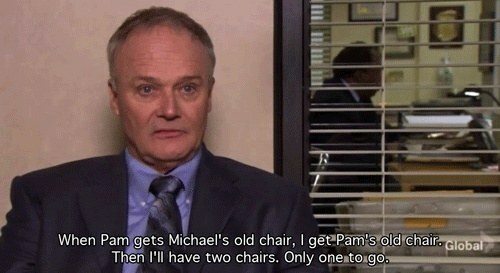 Although, one Michael thing I confusingly missed was his hatred for Toby… because I DON’T UNDERSTAND IT. Toby is a delight, don’t @ me. Dwight is a strange character, I enjoyed him, but I have no doubt in my mind that we would not have been friends in real life. I will never forget that DWIGHT KILLED (or mercy-killed) ANGELA’S CAT, but also, how great was it when she whipped a cat out of her desk drawer? #WorkGoals. I may not agree with Angela’s horrible views on life, but I deeply connected to how much she loved her cats – don’t worry, it’s not on the same level, not yet. Jim and Pam are real cute, but also really, really annoying. Seriously Jim, listen to Pam for a bit, consider her feelings, maybe don’t kiss her when she says “NO” and also, you’re being a little bit selfish when you go follow your dreams and expect her to be a full-time mom and also have time for your bullsh*t. Part of me wanted her and the cameraman to have a thing, but in the end, I am glad they didn’t. Each and every character had a reason to be there, regardless of how minor the role seemed. Meredith was perfectly gross, Stanley was perfectly lazy, and Phyllis is really underrated and keeps on surprising me. Also, I love that we are always reminded that Bob Vance is Bob Vance from Bob Vance Refrigeration. Kelly and Ryan are the most frustrating couple I have ever seen on-screen, but I kind of enjoyed it. They are toxic, yet there I was, feeling a bit of joy every time they relapsed and found themselves in each other’s arms. Also, when did Ryan become so irritating? I felt like he was the only “normal” one at the beginning. HOW COULD THEY JUST LEAVE HIS BABY?? Okay, so I never really like the introduction of new characters, but I got used to Andy and Erin and I got used to Andy and Erin as a couple, so I was a bit bummed when she went off with plop. Oscar was the token nerd, plot twist, also the token gay guy and plot twist, the token Mexican-American. That bit between him and Angela and the senator was really messy. I didn’t enjoy seeing Angela, this strong, horrible woman, being broken down into an insecure, pushover. The 9,986,000 minutes song had me weeping as though I was watching an episode of Grey’s Anatomy. Why did it make me SO sad? Although, it could have been a perfect finale had the finale not been so bloody perfect. Creed was a masterpiece and I will forever be grateful that he exists. 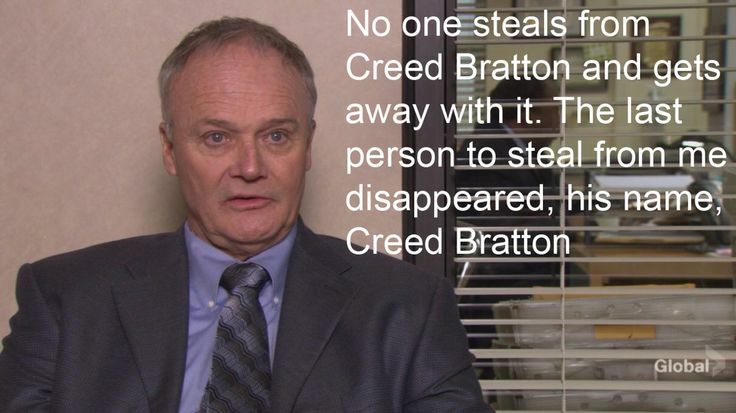 Here are some Creed scenes, because you deserve it. So, how long before I can re-watch it?